– Girl, participant Child Rights Club in Kumasi, Ghana. “Broooooooni!”, children start calling out as they enthusiastically run towards me and put their little hands on my hands, arms and legs. Dr. George Oppong, director of Defence for Children International – Ghana sees my confusion and surprise and explains “broni” means “white” in Twi, the most widely spoken language of Ghana. A warm welcome. We’re at a school in Mmaape, a community in the Kumasi district, Ashanti region. West Ghana, that is. We came here to talk to community leaders, a local child protection committee and a children’s rights club. Some clubs started out as girls clubs, but boys were also interested and a bit jealous. Now, more often boys are included and girls clubs become child rights clubs. The groups usually meet once a week, facilitated by a teacher. We visited three schools in three communities: Mmaape, Buokrom and Obuasi, all in the Ashanti region. Children are about between 11 and 15 years old. The girls clubs, children’s rights clubs and child protection committees were established and facilitated by Defence for Children International – Ghana (DCI Ghana) and the Ghana NGO Coalition for Children’s Rights (GNCRC). They are part of the larger Girl Power Programme (2011-2015), aimed towards the elimination of gender-based violence against girls and young women and their economic empowerment in ten countries. This programme is funded within the MFS II-framework of the Dutch Ministry of Foreign Affairs and carried out by the Girl Power Alliance, consisting of DCI-ECPAT, Plan, Women Win, Free Press Unlimited, Child Helpline International and International Child Development Initiatives. “We learned about rights”, children immediately respond usually. “Right to education, to life, to play, name and nationality, health care”. But also: “the right to views, an opinion, the right to participate in programs, to share problems, to respect”. “And to vote”. A boy looks uncertain and some start giggling. “Noooo”, the director of DCI Ghana says. “Voting is a right children do not have, but only adults do”. “Ah”, he had forgotten. With rights come responsibilities, many say. But what responsibilities do children have? “Run errands, fetch water for your family, obey parents and elderly people”, they say. 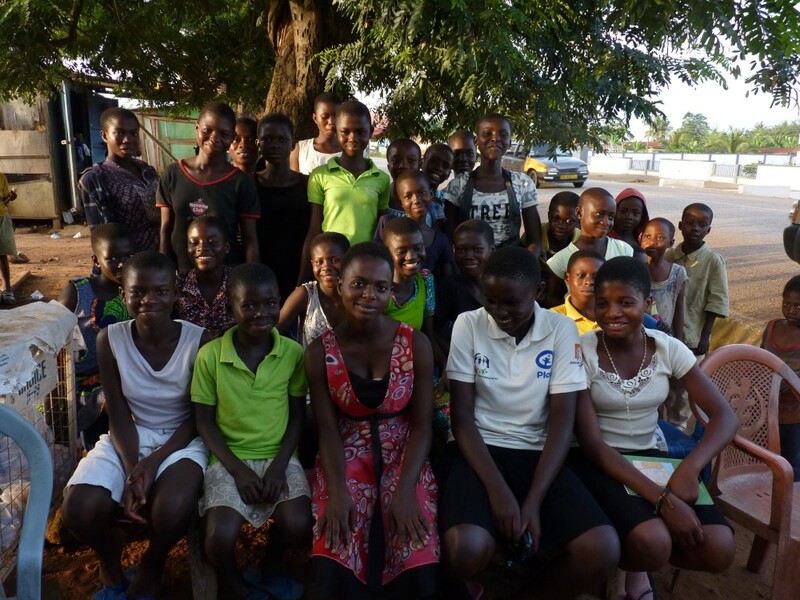 Girls of a girls club in Piase, Ashanti region, Ghana. October 2015. Children also learned about violence. They repeat, simultaneously: “sexual violence, emotional violence…”. They know the types, signals and possibilities of reporting. We can deduce from children’s responses that they see rights as claims they can use against mainly adults that would want to do something to them that is not allowed by these rights. They can use their rights as a way of defending and protecting themselves. They see Defence for Children as a helping hand, which helps defending their rights. To me, the contrast between the children in these communities and the ones I have visited in Panama and Costa Rica, can’t be more striking. These children are very conscious of their rights and can verbalize them very well. What couldn’t you do before and can you do now, that you are taking part in the children’s club?, my manager asks. One girl tells she is an orphan. “I now know my rights. I know how to report and fight back when my rights are violated. Before, I did not know what to do.” She says adults took advantage of her. The children’s rights clubs are fun as well, they indicate: “ we had a chance to interact with other schools, in a girls football tournament”. The teacher explains that many want to join the club and a selection needs to be made. Lastly, resources such as uniforms, school materials and school fees were provided to the girls clubs by the NGOs. I must admit: for a long time I have been wary of the usefulness of rights-talk for children (see for instance my research on the legal consciousness of children in Dutch secondary schools and the legal consciousness of indigenous Panamanian children on Costa Rican coffee plantations). Because being able to repeat all rights, does not necessarily mean that children entirely grasp the concept of rights or can actually do something with it. Meaningful human / children’s rights education requires contextualization, Manfred Liebel learns us. It has to make sense in the world of children. They must be able to link rights to their daily life situations. Then, it can make a difference, as it does for the children taking part in the children’s and girls rights clubs. They prevent, identify, report and act upon rights violations. They advise their peers and put their rights to action. Note: The teachers and staff of Defence for Children International – Ghana (DCI Ghana) and the Ghana NGO Coalition for Children’s Rights (GNCRC) primarily asked questions to the children. We posed our questions usually first to them. In some instances, children asked us questions directly, allowing to engage in a dialogue. See as well the quotes-section on this website.